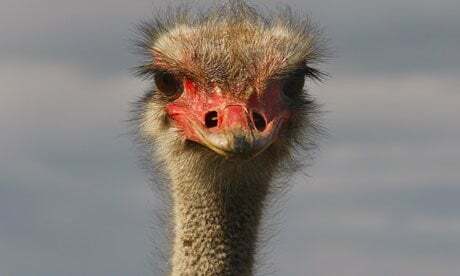 I left Emerson after a year, and I didn’t see Noah again until the late 1990s. By then, I had become a writer, and he had become a film and TV editor. We hung out in New York and L.A. a couple of times in ’98 or ’99, hoisting a few and talking about the old days. We blinked. Another 20 years passed. What we used to think of as “the old days” now seems like part of the fossil record, and that visit in New York seems like the new old days. Now I’m a husband and dad, still writing books but mostly paying the bills with IT work until some Hollywood types decides they want to option one of my novels. Noah is still working in editing (and was even nominated for an Emmy), but some years ago his life took an unexpected turn, as the most interesting lives do: he began to explore the world of barbecue. Of course, being Noah, he couldn’t just be sort of interested in barbecue. He had to become a barbecue expert, contributing greatly to the barbecue culture by judging numerous contests in the West and Southwest; participating in barbecue competitions with his team, Il Prosciutto Violento; and also writing, directing, and producing a 24-minute documentary called Over The Coals: Santa Maria, the BBQ Capital of the World. Now, I’m no expert, but I have been pretty keen on smoking meat for over a decade. My wife got me my first smoker for Christmas in 2006 or so, and I used it until it literally disintegrated. Since then, I’ve simplified things. For the past few years I’ve used only a Weber kettle grill, the same kind my grandfather trotted out every summer on July 4 to carbonize hot dogs on. It turns out Webers are great for smoking meat, if you use the fuse method of laying coals. They also last forever. I’m pretty sure my grandfather’s Weber is probably still being used by someone somewhere, even though it was likely made in 1960. My favorite thing… …to smoke is pork shoulder, after marinating it in Coke overnight and rubbing it with cocoa powder, red chile, cumin, and salt. My second-favorite is mackerel, which I can catch fresh off the wharf in Mahone Bay, a five-minute walk from my front door. Let me tell you something: if you leave this planet without having had the pleasure of eating smoked fish that you caught yourself that morning, your time on earth will have been just a teeny bit wasted. Noah and I had been talking for a long time via Facebook about doing a smoke together. Our plan had been complicated by geography: he lives in L.A. and I live in Nova Scotia. But he had the chance to pop up north for a few days while visiting family in Boston. When he told me he was coming, I felt a frisson, because I knew that barbecue history was about to be made. 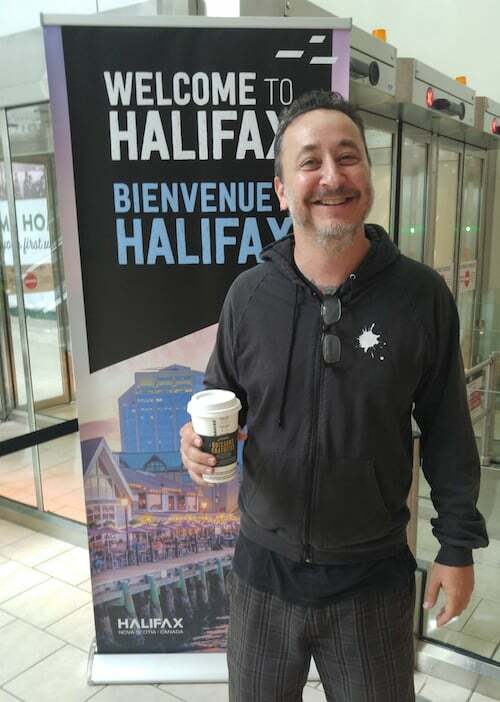 Noah arrives in Halifax, looking surprisingly chipper considering he was up all night playing foosball in Toronto. …and we went straight to Costco to do some meat shopping. We had planned to do a brisket and a few pork shoulders, but we couldn’t get any brisket. Nor could we get tri-tip, which the butcher said they hadn’t had in years. Tri-tip is more popular in California anyway, said Noah. (In fact, that is the only place I’ve ever had it.) We spent a good half-hour discussing what cuts of meat to substitute, because we are men and meat is a very serious subject. In case you don’t have the patience to watch it, the video above shows us waffling between two eyes of round, or one eye of round and one center cut. We ended up going with Door #2, but it was not a decision arrived at lightly. After Costco, we went to Mezza for chicken shawarma poutine with garlic sauce. 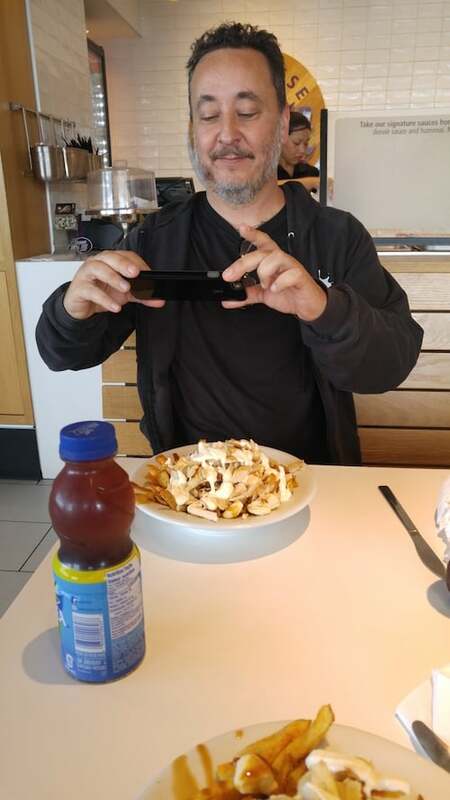 A picture of Noah taking a picture of his chicken shawarma poutine bowl. 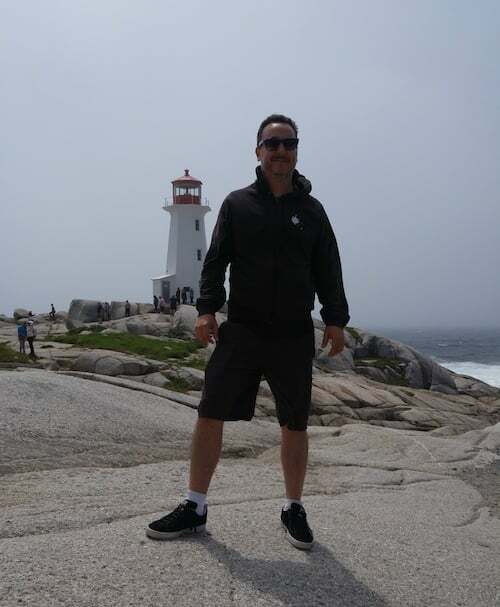 Then it was off to Peggy’s Cove for the obligatory picture in front of the lighthouse. It was twenty degrees colder there, and the stiff breeze brought it down another ten. We lasted about five minutes. Noah Rosenstein in front of the lighthouse at Peggy’s Cove, N.S. 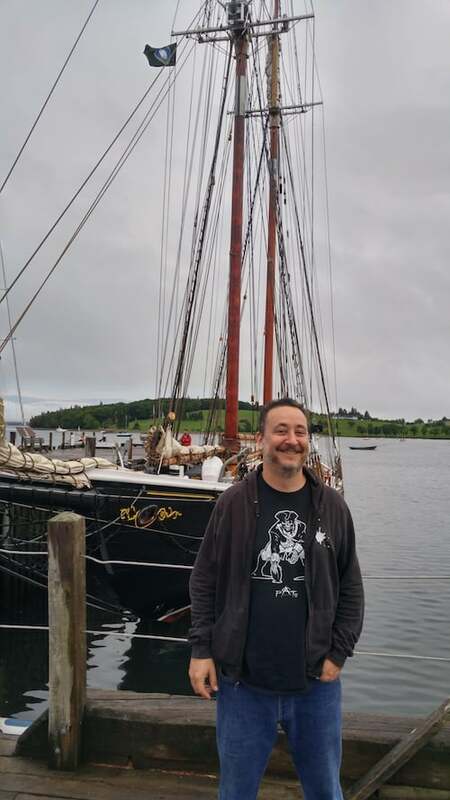 After an evening at The Saltbox, Mahone Bay’s brewpub, and another obligatory tourist shot in front of the Bluenose II (the ship on the back of Canada’s dime) in Lunenburg, we turned in early to get ready for the day ahead. Noah posing in front of the Bluenose, Lunenburg, N.S. I got up at 6 and rubbed the pork shoulders with kosher salt so they could dry-brine for a couple of hours. We started smoking them at 8, figuring they would take about 8 hours. They needed to come up to 200 degrees internally. The beef only had to hit 140, so we could start that later. Before the shoulders went on, I rinsed the salt off and Noah rubbed them with his proprietary spice mixture. He’s going to be producing it commercially soon. Keep your eyes peeled. 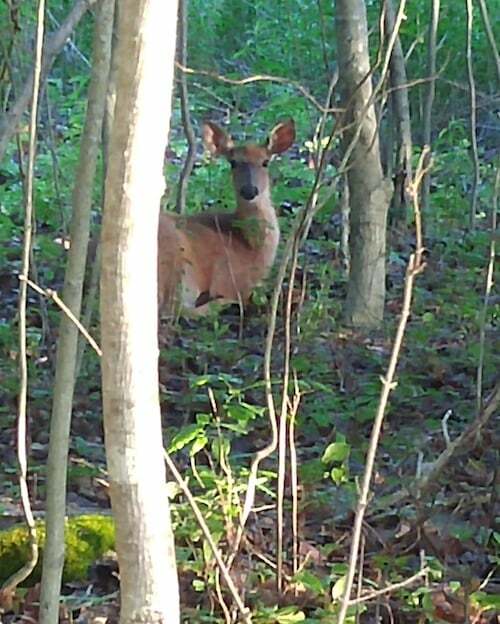 I went out into the woods behind our house to get some dry sticks for starting the fire with, and that’s when I noticed this little guy, who was trying to be extra quiet so I wouldn’t see him. I tried not to scare him, but he ran off anyway. This guy really doesn’t want to run into Il Prosciutto Violento in a dark alley. We got the fire going, and on went the meat. The silver things you see here are foil packets containing our soaked wood chips. We used apple and hickory for the pork, mesquite and hickory for the beef. 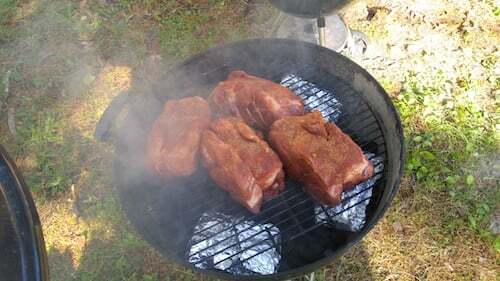 Pork shoulders at the beginning of the smoking process. We rubbed the beef with a mixture of garlic salt, kosher salt, and black pepper. I forgot to take pictures of that, because I realized at around 7:30 am that the grill I had planned on borrowing from my neighbor was far too small to be of any use. So, I made a mad early dash to Canadian Tire to see if I could get another Weber, ideally one that was on sale. I got even luckier than that–I found a new Masterchef smoker that had been marked down to $79. Sold. I dashed home again and assembled it in record time. We got crazy and threw a few eggs on the smoker, because we were curious about what smoked eggs would be like. Turns out they’re really not worth the effort. If I try that again, I’ll brine them first for a day or so, maybe even in some leftover dill pickle brine. This might make the shell soft enough to allow some of the smoke flavor through. I suppose the other option is to hard-boil them first, then shell them and put them on the grill. Fast forward to about 4 PM. Our guests were due to start arriving at 6. The pork wasn’t close enough to 200℉ to convince us it would be ready by then, so we finished the shoulders in the oven at 325℉ for a couple of hours. Before we put them in, Noah sprinkled them with brown sugar and doused them in barbecue sauce and apple juice. We sealed the pans tightly with foil and just let them go to town. 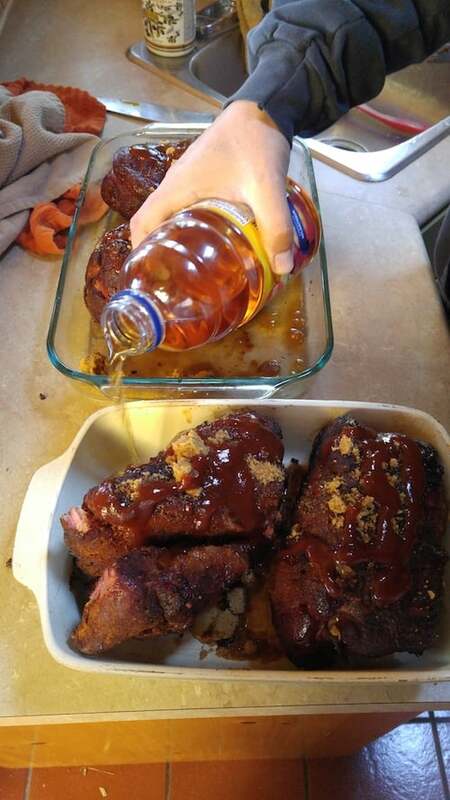 Noah pours apple juice on the pork shoulders, which have already been sauced and sugared. At this point, I became too distracted with hosting duties to remember to take any more pictures. I regret this, but since photos can’t capture flavor, they would have been a disappointment anyway. The pork was done by 6:30. We pulled them apart with forks and simply poured the juice from the pan–which consisted of apple juice, brown sugar, barbecue sauce, and pork fat–over them. The beef was also very tender, the center cut more so than the eye of round, at 140℉. We served this without juice, but with sauce. The intention was for everyone to make sandwiches with it, but people just starting grabbing it with bare hands and shoving it into their mouths, which is a sign that something is really good. It’s hard to describe this meat in words, because words in the end are largely meaningless when compared to experience, and it’s therefore almost an insult to the quality of the food to do something as mundane as write about it–except that I want other people to know about it, so they can eat it, too. The rubs on the outside of both pork and beef had hardened into a crispy, caramelized, almost candy-like rind, called bark, which you could peel off with your fingers and eat by itself, or as an accompaniment to the main event. It exploded in the mouth like some sort of culinary firework show. 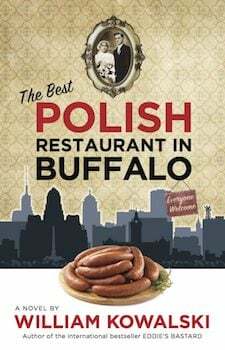 The meat itself simply melted on your tongue to the point that chewing was scarcely necessary; the only reason to chew was so that you could disperse more atoms of flavor throughout your very lucky mouth. I could taste every spice, lots of smoke, the natural flavor of the meat itself, and some sort of overarching emotion that really, really well-made food seems to bring out in me, which could probably be summed up as “gratitude for being alive”. We had a party, as you do. There were 30+ people in attendance, including lots of kids and teenagers. We played Talking Heads and other excellent 80s music, which is the best kind of music, though there are a few other genres that do a decent job. The weather was perfect: mid 70s, clear, and dry. People drank beer and wine, relaxed on the deck, shared the dishes they’d brought, told stories, and laughed. New friends were made and pre-existing friendships were cemented. A bunch of girls ganged up on a boy and put makeup on him. Another kid fell off the trampoline and almost broke his wrist. Everyone raved about the meat. I forgot to get pictures of all of that, too. Trust me: everyone was beautiful, and the food was delicious. Both pork and beef were, without doubt, the best barbecue I’ve ever had. Thanks, Noah! You can come back to Nova Scotia any time.